The Money Saving Custom Door: Fiberglass Door is a beautiful and unique door to add to your home. 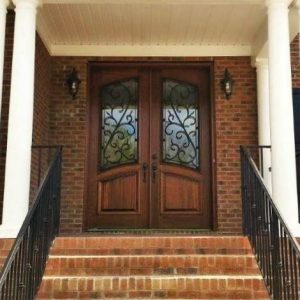 Our team at Southern Front Doors can help you find the best fiberglass door for your home and your budget. Stop by today and choose your custom door. Fiberglass doors require little preventative maintenance which is good for the homeowner. Also, the door is known to have a long-lasting lifespan. They are mostly made with natural resources that reduce warping or other structural issues that may occur. Therefore, you will save money by avoiding the task of frequently purchasing a new front door. Energy Efficient. Fiberglass is well known for their insulation. Since this type of door consists of heavy insulation, your home can remain at your desired temperature without overworking your system. Our doors are GlassCraft and Therma-Tru doors which are known overall for their durability, energy efficiency, and above all style. At Southern Front Door, our clients can look through our large inventory to find the perfect door for their home. For more information, contact us at 281.890.5860 or visit our website here. Set your appointment today and enjoy your door tomorrow!! !